It is well known that Eloise lived in The Plaza. But the book was published in 1955, well before Manhattan real estate skyrocketed. So what would her apartment be worth today? In fact, many children’s books have been set in New York City—think “Harriet the Spy” or “Stuart Little.” In this day and age of record-setting prices, how much would those fictional characters have to pay to live in their homes today? Who would have seen the most appreciation, Eloise or Lyle Crocodile? 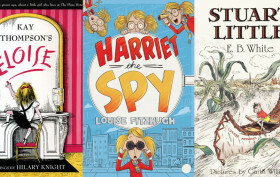 Much detective work (à la Harriet) reveals the residences of a boy-mouse and a anthropomorphized girl dog span various neighborhoods including the Upper East Side, Gramercy Park, and Park Slope. What follows is a survey of six iconic picture books set in New York City and the current valuations of their fictional homes.